As a mostly dirt rider, my collection of headgear consists strictly of off-road helmets. Hanging in the garage on display, everything from my first helmet with a bright red dragon on it, to my newest in a sleek matte black that is so lightweight, it made me wonder how I was able to keep my head up in my youth helmets. With technology always improving and helmet manufacturers getting extensive feedback from racers and industry experts, it is hard to imagine what helmets will look like in the next five to 10 years. I’m guessing they’ll be along the lines of holograms. One of the biggest improvements to helmets in recent years is the Multi-directional Impact Protection System (MIPS). MIPS first marked the map in the mid ’90s and was first applied to helmets in the mid 2010s, being in demand ever since because manufacturers see the need to create gear that can significantly improve safety for riders. So what’s so great about MIPS? The technology prevents the brain from moving inside of the skull. Instead, the low-friction layer slides in the direction relative to the head to absorb the impact and prevent rotational head trauma. The extensive studies on MIPS and easy branding on helmets makes choosing a helmet simple for customers. Stamped with the MIPS logo, it is an easy sell to new riders who are getting into off-road riding and racing because when you’re new at something, you want to have all of the protection that’s available. When I first got into racing, most of my equipment was hand-me-down from friends and family. If my helmet didn’t fit right, I’d have to tie my hair back and add a few pieces of foam that didn’t always stay in place, meaning halfway through my race, I’d be pulling my helmet back into position where it was designed to fit but didn’t want to stay. After years of discomfort, I was able to purchase a helmet that was the right size and it made a world of a difference. When a helmet fits securely, it will provide protection. If it is too loose and falling off of your head, chances are, you’re going to get injured, resulting from either lack of impact protection or from distraction. In addition to impact protection, if a helmet doesn’t fit, all of the design benefits of its ventilation, visibility and insulation are rendered almost useless. Make sure you fit customers to the proper helmet size and show them how to secure the helmet to their head correctly. 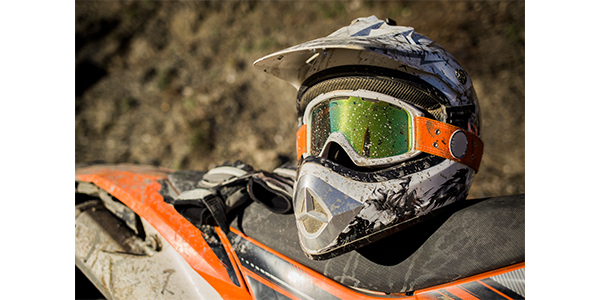 Another important factor of off-road helmets is that they are used for the right application. I’ve seen riders blasting down the interstate on a motorcycle with one hand on the throttle and one hand holding their off-road helmet in place to prevent it from flying off. The visors can pick up wind and blow the helmet back, regardless of a perfect fit. Identify your customer to sell the right gear for the ride. Building a relationship with your customers will have them coming back when it is time to upgrade their gear to get the latest technology to keep them safe, and you’ll be the first to let them know when the holograms are released.